Among the traditional dresses of the Meiteis, the dresses of the deities may be mentioned in the first place. 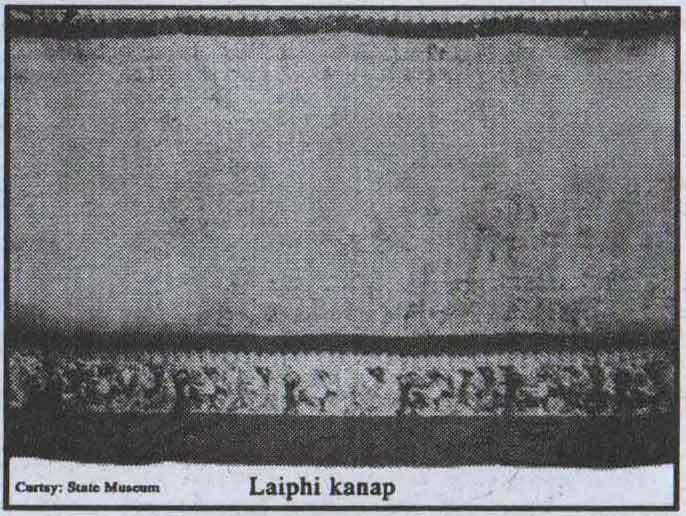 In this regard, mention may be made of the cloth of Chinphi and laiphi which is used at the time of rituals. The Chin phi is the Tonkap Phanek which are not embroidered in the border and the Laiphi is the white colour cloth having yellow border. Namthang Kokyet is another type of cloth which is used as turban of the lairemmas (goddess) which are worshipped as Umanglai, the tutelary deities in every villages. The traditional dress of the coronation ceremony of the Meitei king and queen can be traced for the period back to first century A.D. The manuscript `Leihou Naophamlon’ gives a vivid picture of the coronation dress of Nongda Lairen Pakhangba and his consort queen Laisna. According to this source of information, the coronation dress of the Pakhangba were-Leiruthak, Ningkham, Phirel Lushet, Lollei, Samjin Lengkhang, Konkha Phurit, Phihai Ningkham, and the coronation dress,of the queen Laisna were-Lurel Luchao, Kumsang Phanik, Kabrang Kanak, Kabrang Khawon, Pheisa Lengkhang, Phurit Samparet, Phiren Kanak, Tharon Phanik, Khanik Khangkha, Pumthit Saiba. The manuscript Thamballon’, Thambal Phiset’, `Laigi Phamballon’ give the coronation dresses of the other kings who reigned after Nongda Lairen Pakhangba. According to available source of information, the coronation dresses of king Naothingkhong (663-763 A.D.) were—Phingang Pheijom, Phimu Khawon, Maimu Tomson, Pheija Lengkhag, Khaochon Phurit, Yairong Phanek, and Sarong Lamthang for the queen. These coronation dresses were continued from the time of Yoimongba and Taothingmang (264-364 A.D.) upto the period of king Naothingkhong. The coronation dress of king Pamheiba (Garibaniwaj) who reigned from 1709-1748 A.D. were—Leiren Leithak, Chari Ningkham, Phirel Phurit, Lollei, Phiyai Ningkham, Konkha Phurit, Innaphi Langdom. Leirel Leichao, Kumsang Phanik, Kabrang Kanak, Kabrang Khawon, Pheija Lengkhang, Khawon Phurit, Phirel Kanak, Phirel Phanik, Sarong Lamthang were for the queen’s coronation. The manuscript ‘Phamballon’ also gives a valuable source for the coronation dress of the Angom king “Angoupanba” and his consort `Khuraileima’, the queen of Angom. Angom is also one of the major clans of the Meitei soceity. Angora king `Angoupanba’ had a very important role in the administration during the monarchical period in Manipur. Angoupanba was the chief judge in the Cheirap, the highest post during that time. The Angoupanbas had also performed the coronation ceremony like that of the Meitei king. The coronation dresses for the Angom king Angoupanba were Samjin Angouba (head gear of white colour), Khadangchet Angouba Sana Kongol Thinba, Pheijom Angouba (white dhoti), Ningkham Angouba Sanagi Kongol Thinba, Phurit Machi Ashangba Shakakpa Sana Kongol Thinba, Innaphi (wrapper) Langdom Mapanda Sanagi Kongol Thinba. The coronation dress of the Khuraileima (queen of Angom) were-Kumphanek Phibanda Sanagi Kongol Thinba, Phurit Khe Machi Ashangba Sakakpa Sanagi Kongol Thinba, Innaphi, Sarong, Kabrang Kanak. The coronation dresses of the kings of the later period were – Leiruthet, Chari Ningkham, Phiren Phurit, Lonphi, Hai Ningkham, Konkha Phurit, Innaphi, langdom and the coronation dress of the Meitei Leima (queen of Manipur) were as Leiren Leichao, Kumlang Phanek, Kabrang Phanek, Kabrang Kanak, Kabrang Khawon, Pheija Lengkhang, Phurit Saichonba, Phiren Kanak, Tharon Phanek, Sarong, etc. In such way, the dresses to be worn by the Meitei kings only at the time of coronation ceremony were carefully kept separately. The dress of the queen and other wives of the king consisted the Phanek, a striped cotton or silk cloth passed round the body under the armpits and over the breast, a jacket, and an Innaphi. The Phanek is made of cotton and silk and the only patterns are stripes of various colours. At the top and bottom of the garment was a broad margin, on which geometrical figures or patterns of various kinds were sewn by hand with floss silk in various colours. Over the Phanek was worn a white Innaphi.